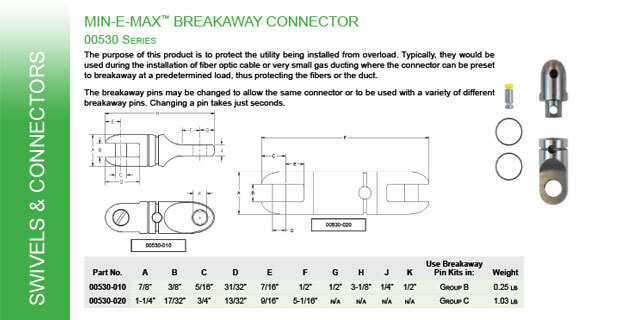 These products are typically used during the installation of fiber optic cable or very small gas ducting where the connector can be preset to breakaway at a predetermined load, thus protecting the fibers or the duct. 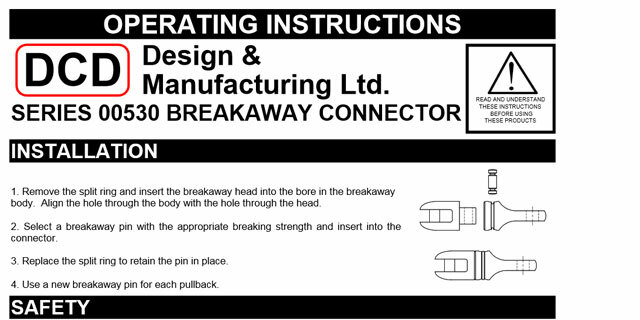 The breakaway pins may be changed to allow the same connector to be used with a variety of different pins. *Uses 00535 & 00555 pins. 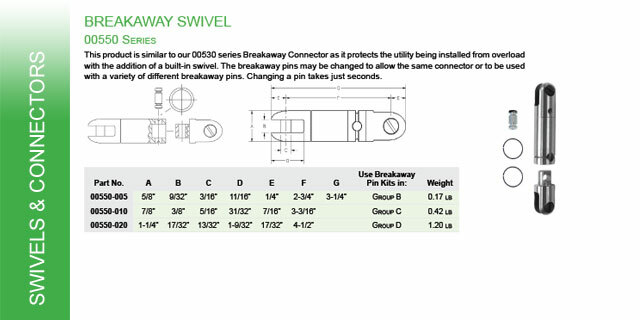 See pin configurations here. 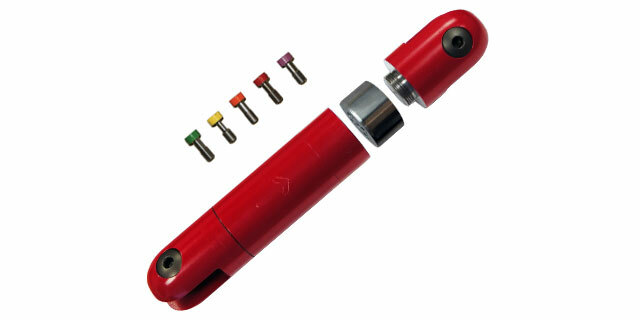 For other uses and industries, visit this site. 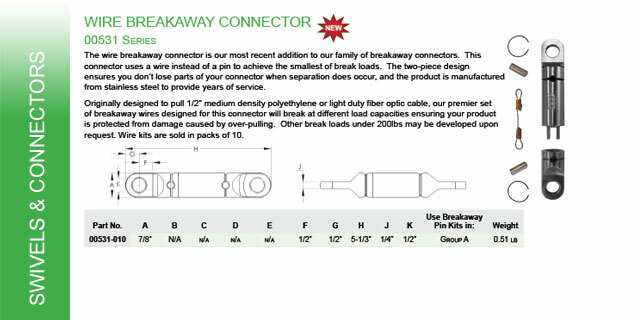 This product is similar to our 00530 Breakaway Connector as it protects the utility being installed from overload with the addition of a built-in swivel. 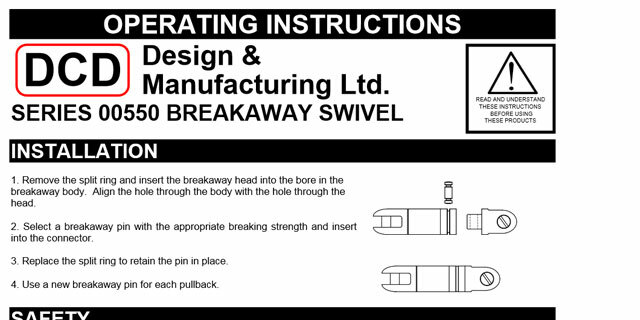 The breakaway pins may be changed to allow the same swivel to be used with a variety of different pins. *Uses 00535 & 00555 pins. 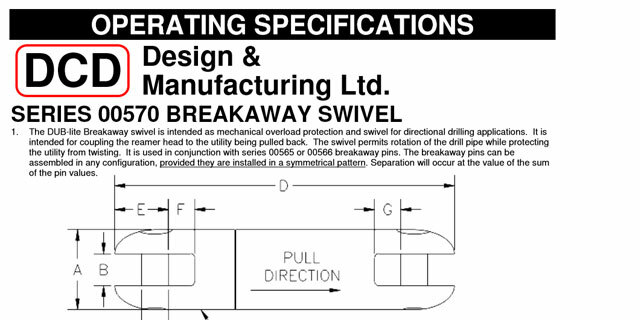 See pin configurations here. 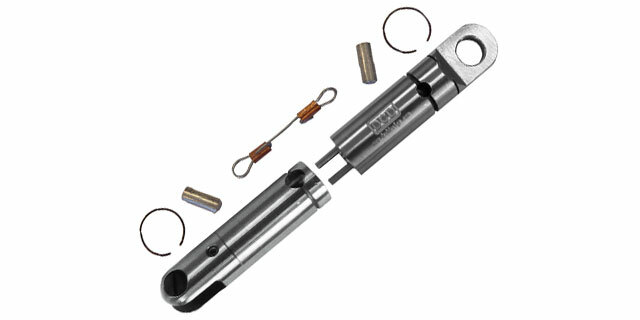 For other uses and industries, visit this site. 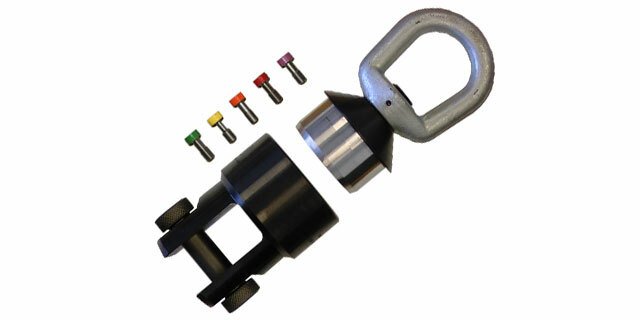 These products are designed to protect polyethylene ducting from overload during installation by directional drilling and are used between the pullback swivel and the duct puller. 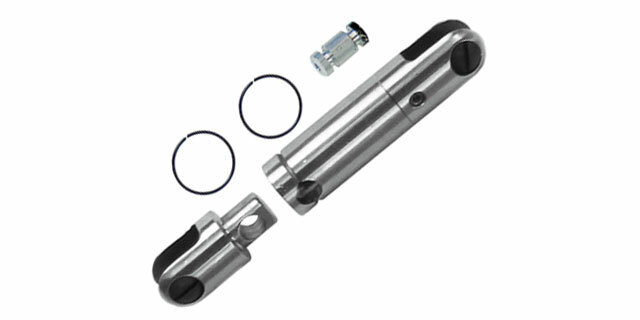 The connectors are a three part product, held together by a group of pins. 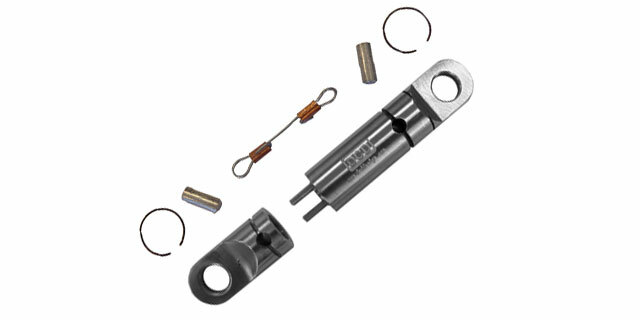 The pins are designed to break in tension at a specific load. *Uses 00565 pins. 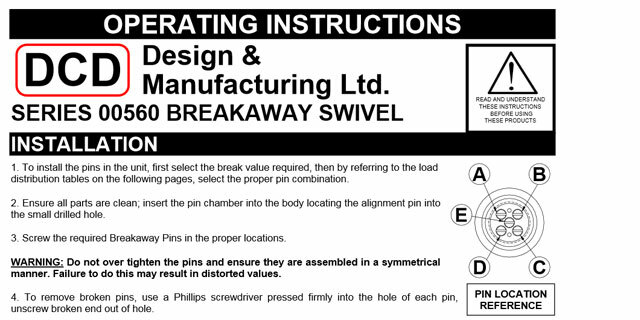 See pin configurations here. 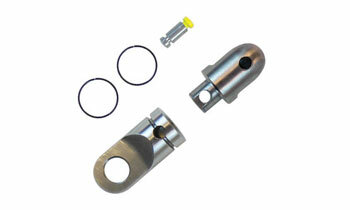 For other uses and industries, visit this site. 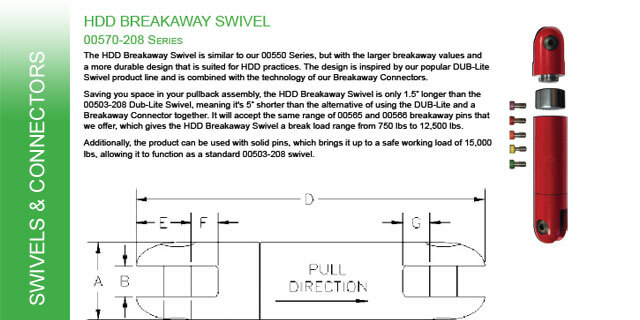 The HDD Breakaway Swivel is similar to our 00550 Series and yet designed around our 00503-208 DUB-Lite Swivel. 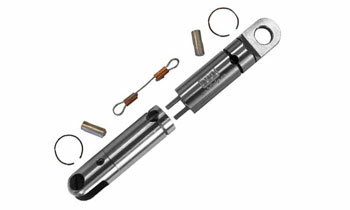 It is only 1-1/2" longer than the 00503-208 Dub-Lite Swivel, but still 5" shorter than the alternative of using the Dub-Lite and a Breakaway Connector together. 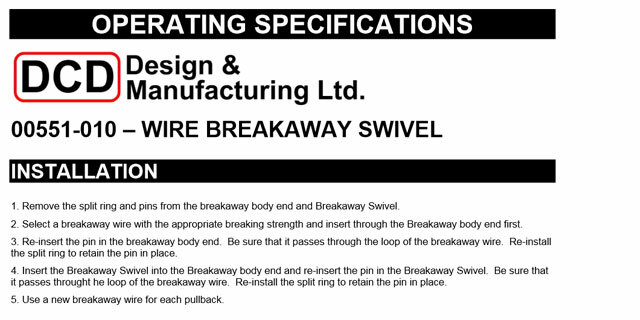 *Uses 00565 pins. 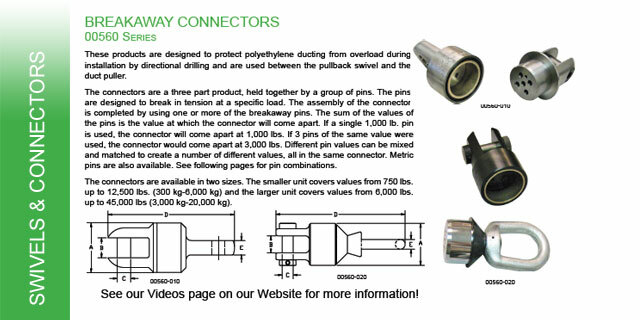 See pin configurations here. 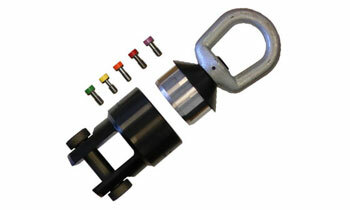 For other uses and industries, visit this site. 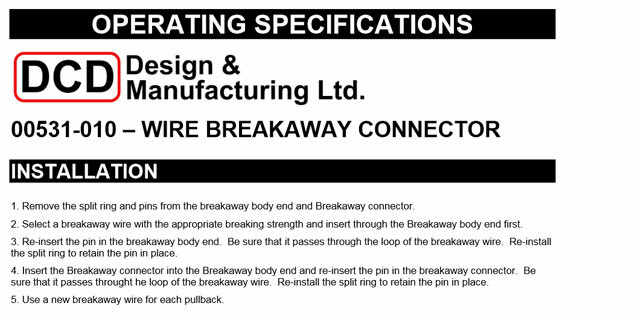 The wire breakaway connector is our most recent addition to our family of breakaway connectors. 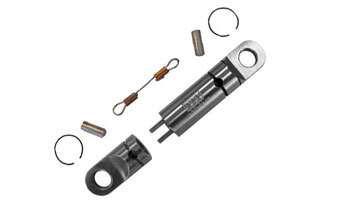 This connector uses a wire instead of a pin to achieve the smallest of break loads. 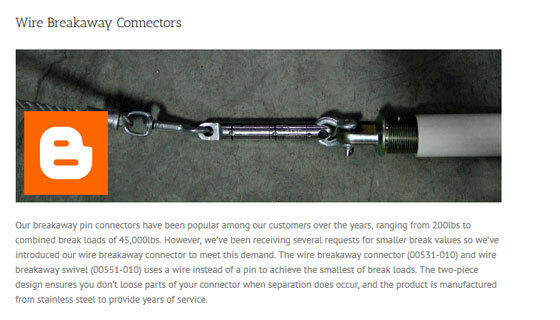 The two-piece design ensures you don’t lose parts of your connector when separation does occur, and the product is manufactured from stainless steel to provide years of service. 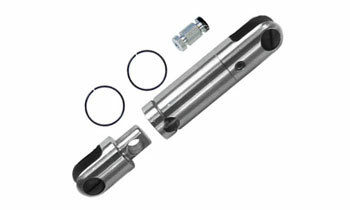 For other uses and industries, visit this site. 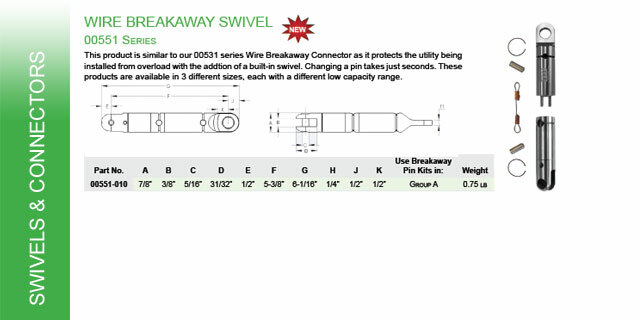 This product is similar to our 00531 series Wire Breakaway Connector as it protects the utility being installed from overload with the addtion of a built-in swivel. Changing a pin takes just seconds. 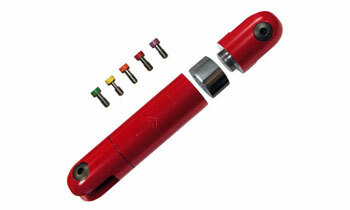 These products are available in 3 different sizes, each with a different low capacity range. 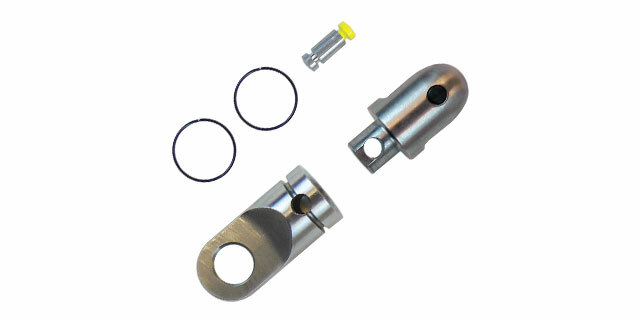 For other uses and industries, visit this site.